Orange Cake Mix - "Harmonies And Atmospheres"
Connecticut-based Jim Rao, a.k.a. Orange Cake Mix, supermarket worker by day and dazzling tunesmith by evening, has been transfixed by all things luminous and dreamy for over seven years; in fact, ‘harmonies and atmospheres’, his latest release, blends a finely honed ‘60's pop sensibility (including Jerry Garcia licks from the eponymous Grateful Dead album) with a strong capacity to weld some of the trippier elements of early-millennial electronica and novelty acts like Pianosaurus. Atmospheres’ highlights include the Steve Howe-influenced guitar ballads ‘Everywhere the light Goes’ and ‘Way Out There’; ‘June Moonbeams’, where the Bauhaus stamp is obvious (the intro conjures up Daniel Ash’s treated guitar work on ‘Bela Lugosi’s Dead’, with processed voices (Japanese Zen Koans, perchance? - certainly a high, keening note), then a Jerry Garcia guitar bridge and finale. Great stuff. Yet another pleasant surprise is the clavier-based and synth-washed melody of ‘Thought Balloon, with a brief sample of ‘Shout’-era Simple Minds percussion thrown about three quarters through the track. Rao is much more interested in melody than percussion, and in that sense, he sticks to what appears his strength. For anyone looking to mellow out after a hard day at work or simply wanting a mellow, dreamlike vibe to accompany work on their own creative projects, ‘harmonies and atmospheres’ is an excellent path to that effect. Jim has been making music since ‘95, on a bewildering plethora of labels, most in the states, some originating in Italy (some of his earlier cassette releases). For more information you can visit the Orange Cake Mix web site at: http://orangecakemix.virtualave.net. Check out Jeff Penczak’s (furious.com) May 2002 interview with Jim Rao at: http://www.furious.com/perfect/orangecakemix.html. 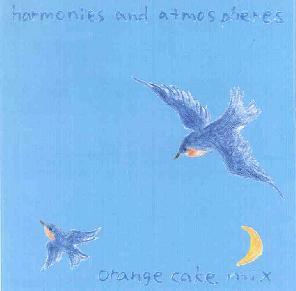 Harmonies And Atmospheres is distributed by North Of January. You can visit their web site at: http://www.northofjanuary.com. Contact via snail mail North of January; PO Box 5691; Burlington, VT 05402-5691.